I first made my hobby horse ornaments last year, and posted one on the old Jupiter Hollow blog, and I'm finally getting around to sharing the how-to, after teaching them last week at Wattle Flat Crafts. Hobby horse ornaments are cute, easy to make and are a great way to use up leftover scraps of fabric and trim. Small bits of fabric for your horse body. Felt is great for not fraying, but most fabrics will do. Tiny bits of matching or contrasting felt for the ears. Something for hair. I used unravelling shoelace and cords and fringed trim. Yarn would probably be very good too. A small amount of stuffing. Other accessories like ribbon to hang them and make a bridle. Some kind of stick. I initially used the sticks left over from my sugar sticks from Fortnum and Mason (pictured). 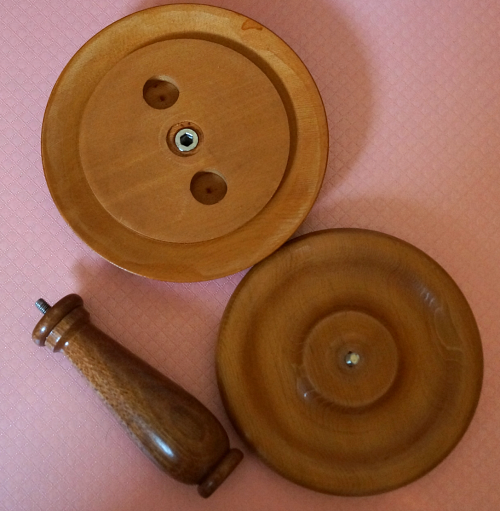 When they ran out, I got some thin dowel and glued wooden buttons on for the end. Needle, thread, glue and scissors. 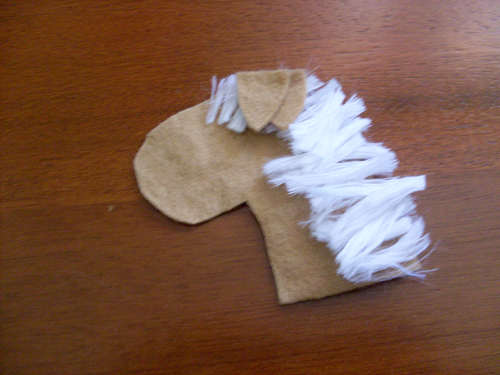 Fold your fabric over and cut a horse-head shape from your fabric (so that you have two matching ones). I do mine freehand, which allows for variation of species and size as required. 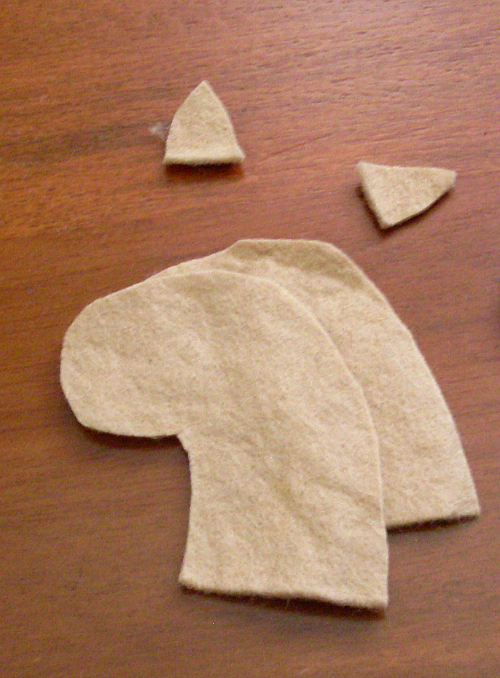 Also cut two triangles for ears from your felt. Prepare your horse hair. My favourite has been unravelling braided cord things. One of which I know I rescued from a shopping bag so a very useful recycling choice! Ribbon can be cut and frayed. 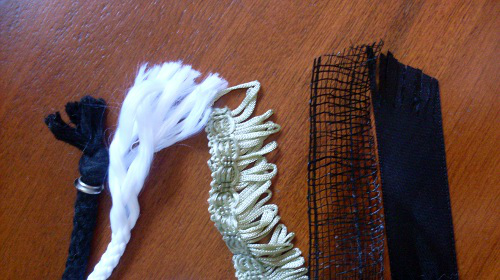 Fringed trims can be cool and different. 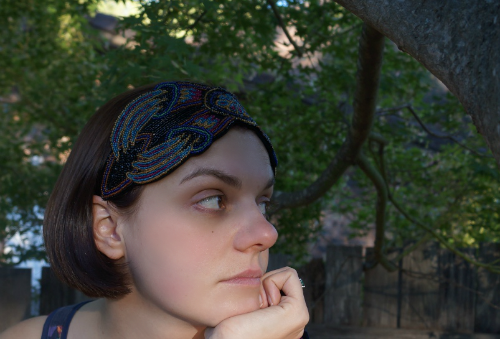 I also experimented with this millinery material I can't even think of the name of, maybe sinamay ribbon? And I think feathers could be fun too, although if you have cats they probably don't need the extra incentive to attack your tree decorations. Cut enough horse hair for behind the ears and a little bit for in front of the ears. Leave a bit blank at the bottom back because that bit will be gathered up anyway and bits there are most likely to fall out as you sew. 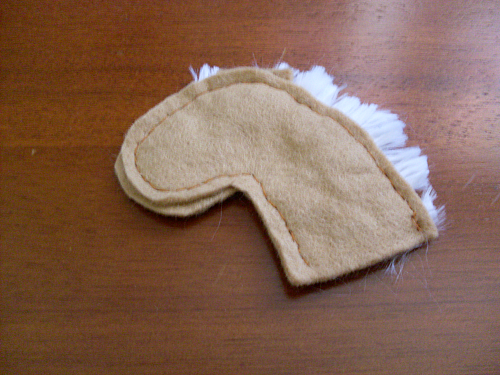 Place one horse head piece flat on the table. Arrange your mane along the back, facing in. Place your ears facing in too. Place the second horse head piece over the lot, lining up the two horse head pieces. 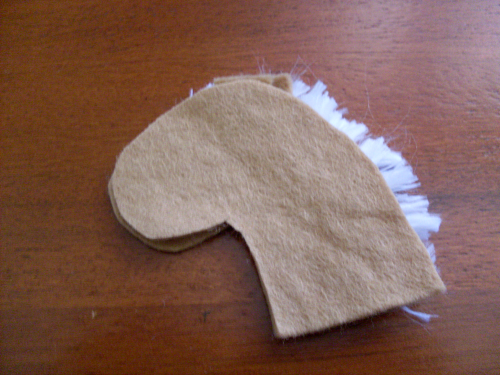 Sew around the horse head, sewing the hair and ears in as you go, leaving the bottom open. I handsewed mine, partially because I wanted to sit in front of the TV to make these, and partially to make sure everything stayed neatly in place. I recommend either a second pass of stitches or some glue over the hair if you have something that is frayed and easy to pull through. Turn inside out and stuff. Trim hair if necessary. Put a dab of glue on the end of the stick to give it extra hold then put it in place. 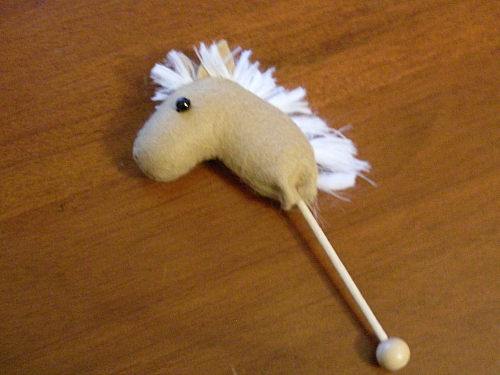 Run a gathering stitch around the base of the horse head and gather it in around the stick and sew in place. Sew, glue or embroider some eyes and attach any other trim you like. Include a ribbon for hanging. Try again with different trims, colours and even try a different animal! Try a reindeer! 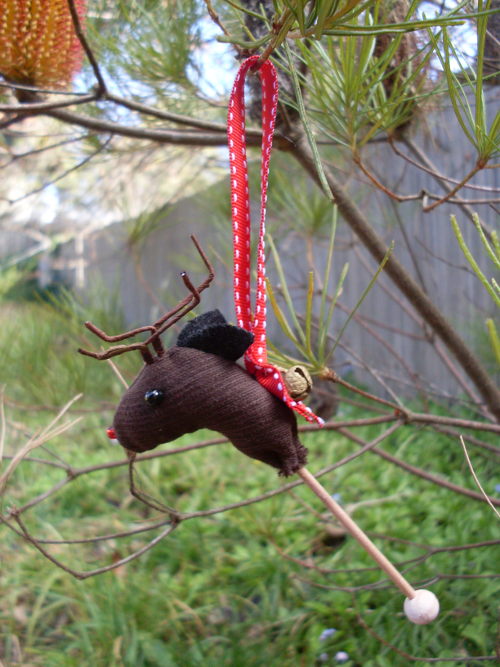 This fellow's antlers are made from the stalks of artificial flowers that I used in another project. I've also done felt antlers. 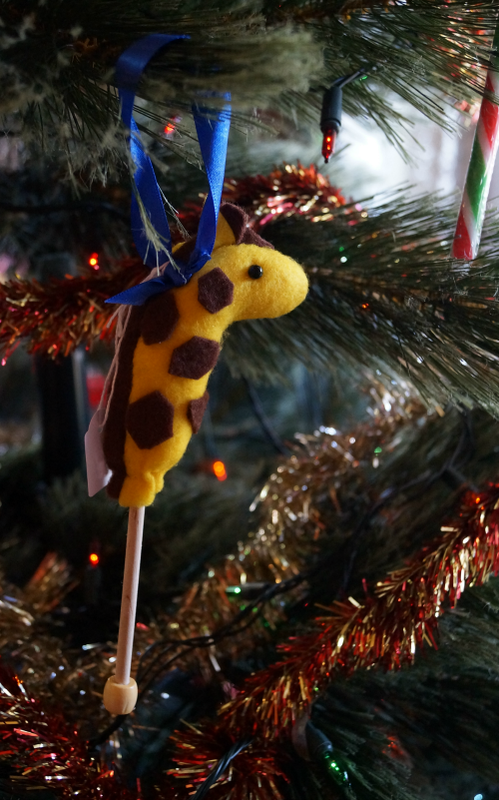 Why not a hobby giraffe? I also made a unicorn and a dragon queen in honour of our old name, and I plan to keep working on my menagerie. 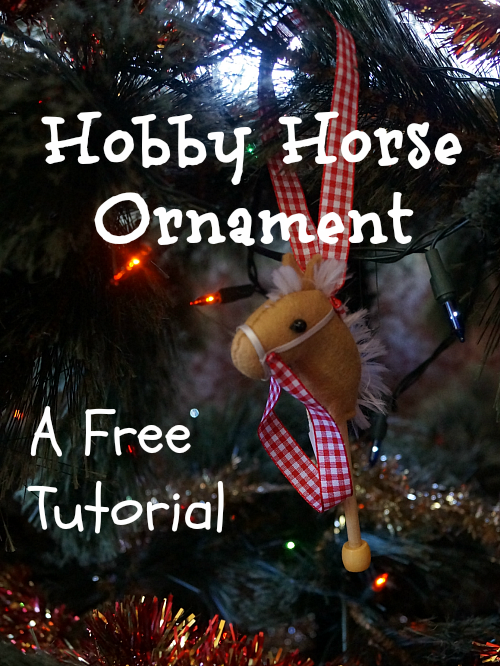 If you make a hobby horse ornament, I'd love to see it! I mentioned before that I was working with my grandmother Wendy to make a craft space in the village of Wattle Flat. It was an idea only about 6 weeks from first thoughts to the grand opening, which was this weekend. 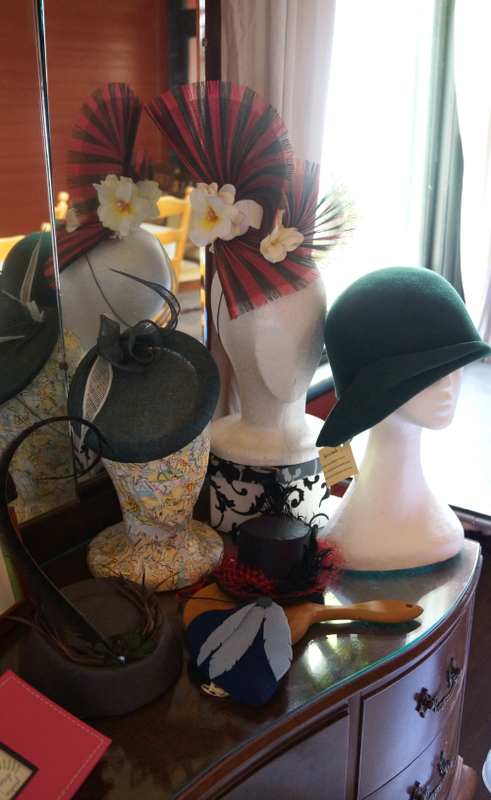 Here are some of my hats on display in the old Courtroom. It's a beautiful space for craft stalls, with high ceilings helping to create a roomy feel, and access to the front and side verandahs for extra space. 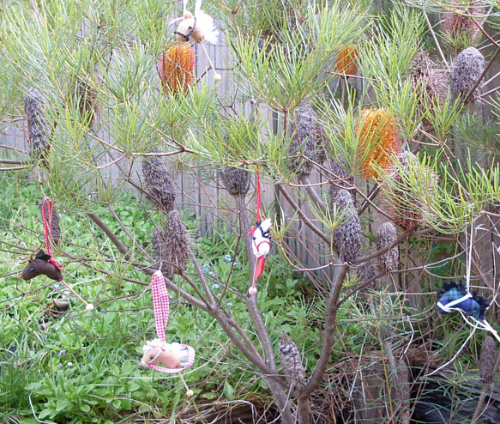 As well as the hats, I've got a few Christmas ornaments on the tree. 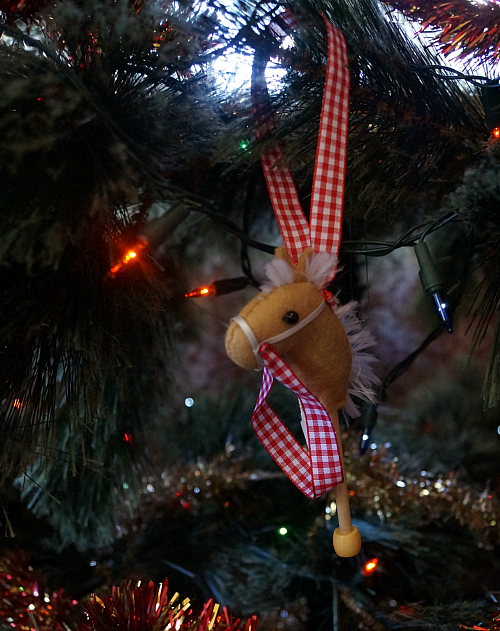 Mostly they are hobby horse ornaments, although not all of them are horses! I was also teaching how to make them, and I'll be sharing a tutorial here soon. Wendy was an absolute star. 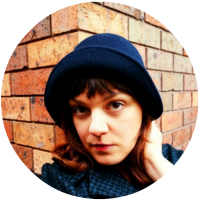 She's been spreading the word for weeks, cleaning the house, tidying the garden, and coordinating all the crafters. Then she had a busy weekend making everything flow and warmly greeting all the visitors. 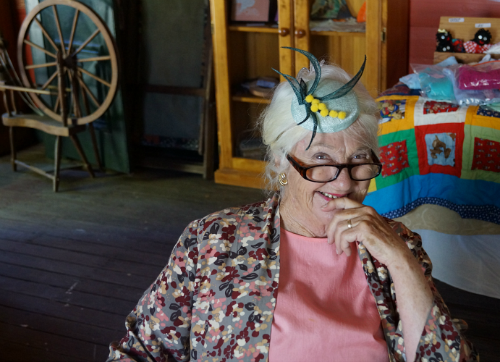 And she does a stellar job of modelling that little Wattle hat. I'm exhausted! Time for bed. It's getting very wattle-ish around here. 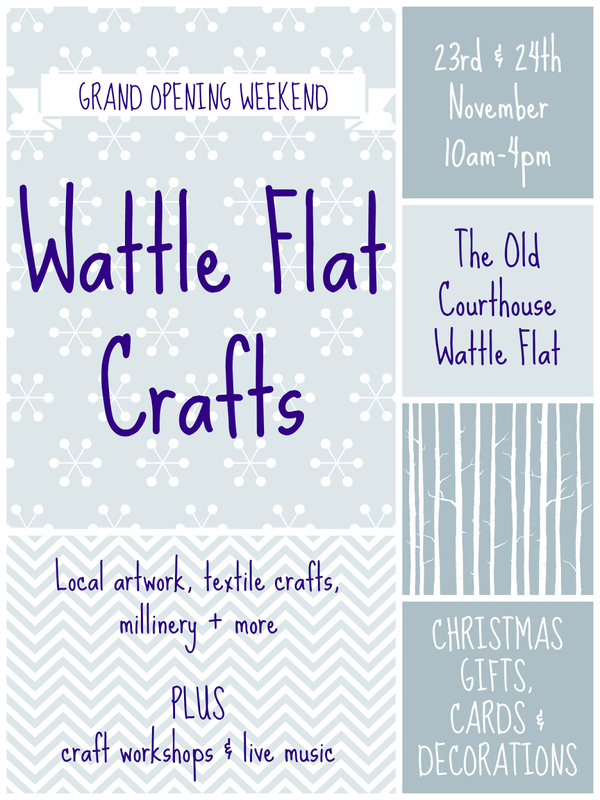 Wattle Flat Crafts is opening on Saturday. 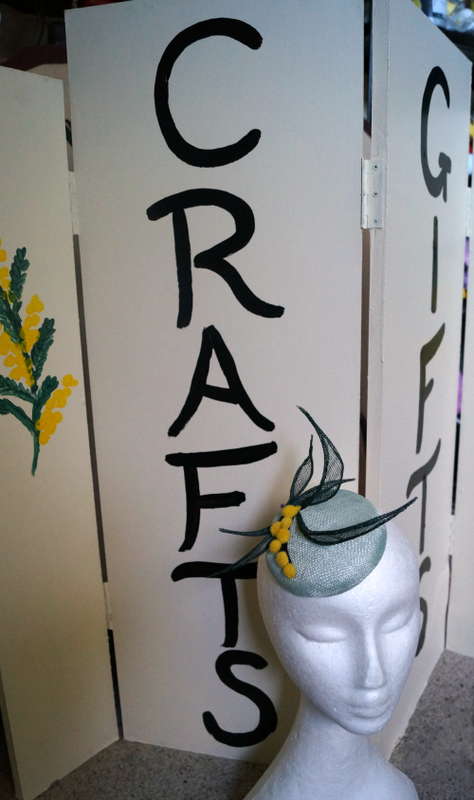 I'm spending my afternoons painting signs, making hats, making Christmas decorations, preparing for my mini-craft-class for the opening (hobby horse Christmas decorations), and planning a longer (millinery) workshop for the 7th of December. I started by playing with some scrap wood in the workshop myself. Just simple pillbox shapes with a uniform cross-section. Things I could cut on the bandsaw and sand and use right away. I made a simple cylinder that I used to block the black pillbox with the veil circle. 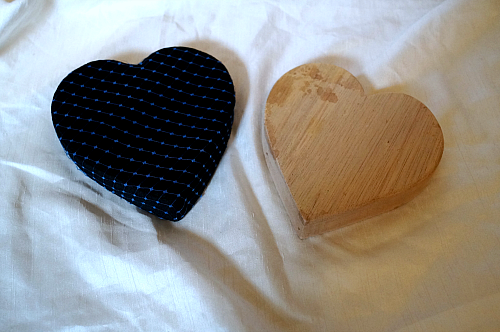 I made a heart shape and blocked this little pillbox that I've yet to finish. It's wrapped in blue veiling but I don't know what else to add. 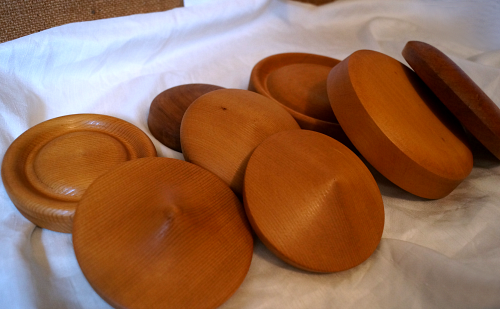 Feeling pretty pleased with myself, I asked one of the TAS teachers if he could teach me to use a wood lathe so I could make some more blocks. 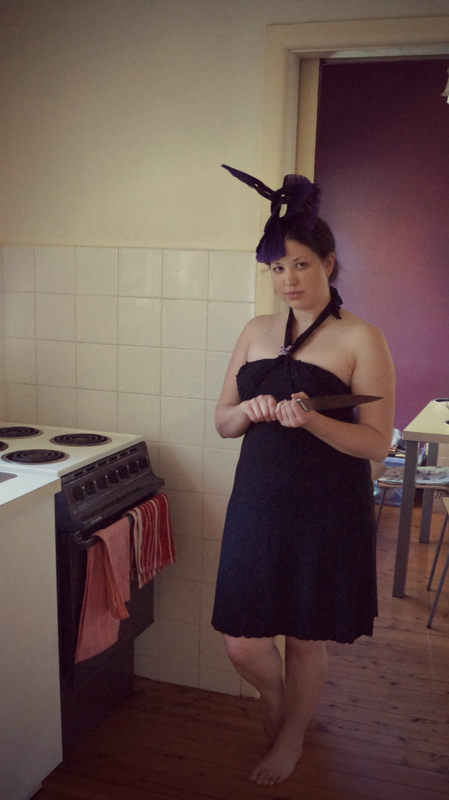 I thought I'd like to have a nice button fascinator. After talking through some ideas and showing him some pictures he came to me with a bag. "I made a set of these in the smallest dimensions. Is this what you wanted? And just one stand, but I can make more." A week later it was "I made some more in the larger sizes. And a bigger stand. Just let me know what else you want. Wider? Taller? More stands?" My block collection has multiplied a lot in the last few weeks. Especially if you don't count sugar bowls. Look at all those beautiful shapes! I even changed my calendar to the correct month for these photos. How is it November already? The stand in the photo above used to be a school desk. They are all made from scrap, including desks and chair legs. The stand comes apart too, so you can hold the block either free in your hand, or with one part of the stand like a handle, or on the stand on the table. 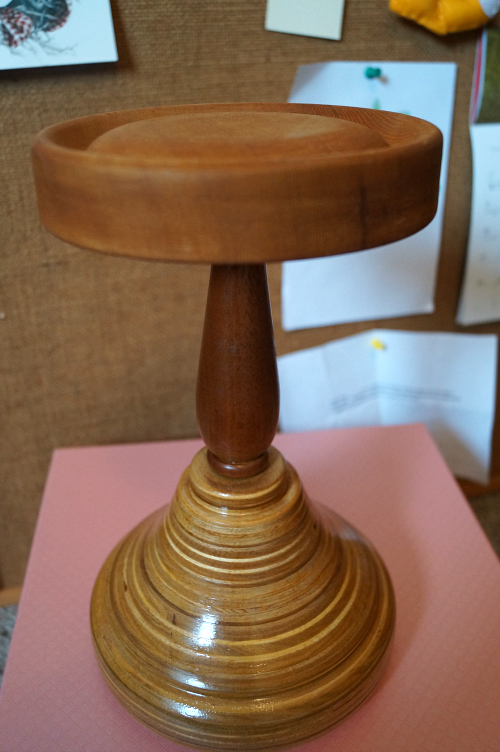 A bored woodwork teacher is a milliner's best friend. 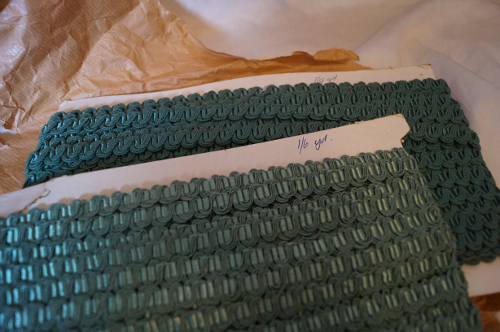 And while we're on the subject of generosity, I was also given two lots of vintage trim (one silk and one cotton) by Dan, the leatherworker who is a part of Wattle Flat Crafts with me. I know some lovely people! Don't have anywhere to wear a hat? Let's be a bit more creative. Why dress up just to impress other people? And if you do dress up for others, they had better appreciate it. If not, you have plenty of options. My great-grandmother was a young woman in the 1920s, and she possessed exquisite taste in fashion. 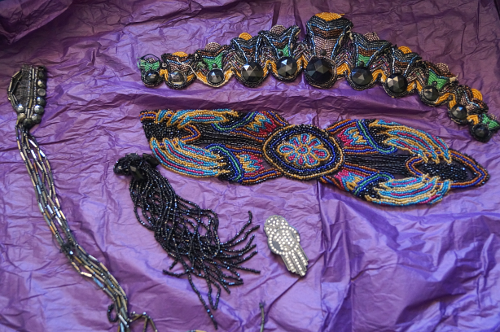 We are lucky enough to have a number of pieces of jewellery and beading that belonged to her. I recently took this small collection home in order to turn them into wearable items again. 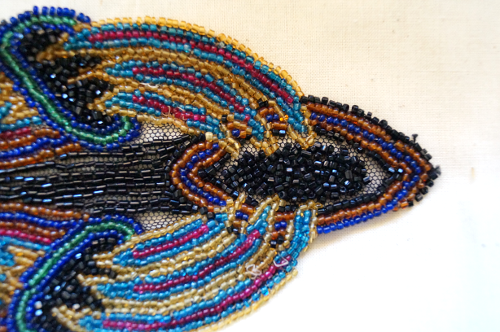 To begin with, today I looked at these section of beading. Beautiful, huh? Even from the back! 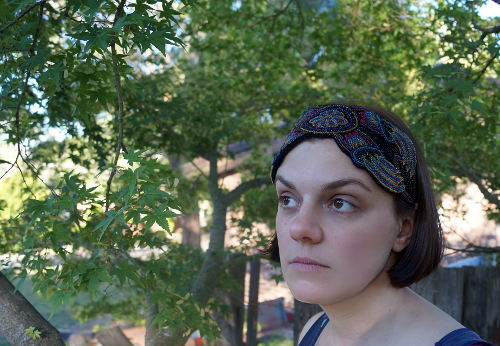 I don't know what it originally was used as, but I wanted to turn it into a simple headband. It is so intricate and colourful that it doesn't need anything else, and I wanted it to shine and be the focal point it deserves to be. It is a little fragile and had a few loose threads and a tendency to roll at the corners. I stitched it onto a background of black millinery felt, resecured the areas where the thread was coming apart, and attached some elastic. Now I can wear this treasure that belonged to my great-grandmother. Conveniently I also got my hair cut into a bob today too! Time to get some 20s dresses and go for a bit of Gatsby style I think. I can't wait to wear this around and also get to work on the other lovely pieces. Another exciting thing coming up is that I am spoiling myself (in a very sensible way) with a new look for my little bud of a business. 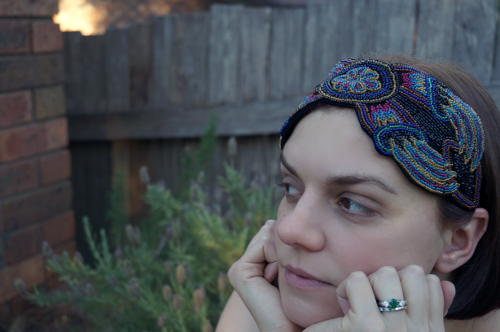 It was only a few months ago that I took my first hats down to Gail's shop. At this time, I couldn't justify spending money on professional help for a business that might be going nowhere. So I drew the rowan leaves myself for signs and the blog, and settled for the free business card option (and some printed-myself-at-home ones before they arrived). Now, with the profits from my first sales in my pocket, I have hired a graphic designer. This brings it's own problems. Here come the shoulds and the shouldn'ts and the can'ts. 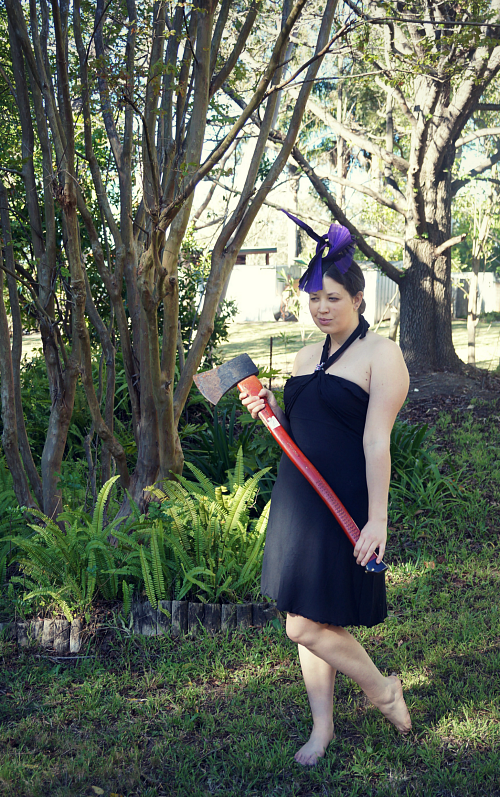 "You're a milliner, your business image should be sophisticated and elegant"
"You can't have cute silly pictures along with elegant formal fashion items"
"You shouldn't post about soft toys or Christmas decorations or geeky illustrations"
"You should present a fashionable image"
These thoughts jostle around in my head. A moment of revelation comes. I love cute stuff! I love fluffy animals! I love lame maths jokes! I love the tackiest Christmas ornaments you can imagine! Darnit it's who I am! I want to pursue what I want to pursue! Having a formal posh branding image will only make me feel bound to it. It will stifle my casual writing style. It will stop me from experimenting with fun new things that appeal to me. It will make me feel like I'm pretending to me someone I'm not. So I'm not going to do it. I'm going to be me. Don't fight the cute. Embrace the cute. This month I am going to be a part of something very exciting! 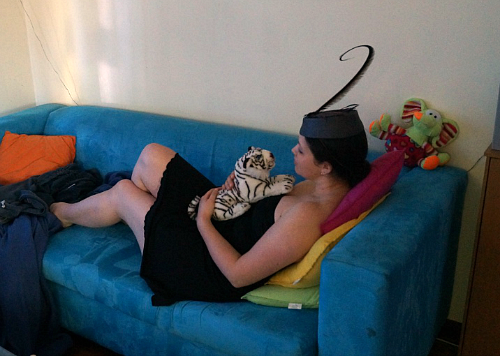 My hats (and some other creations) will be on sale at the Old Courthouse in Wattle Flat. And yes, that is all the address it needs! Wattle Flat is a village in the Bathurst region of New South Wales that sprung up in the gold-mining boom of the 1850s. The Courthouse (and Post Office) was opened in the 1890s and that building is now owned by my grandmother. She has come up with this idea to get local crafters together and is working away to get the large courtroom ready to become a display space for myself and a range of other makers. 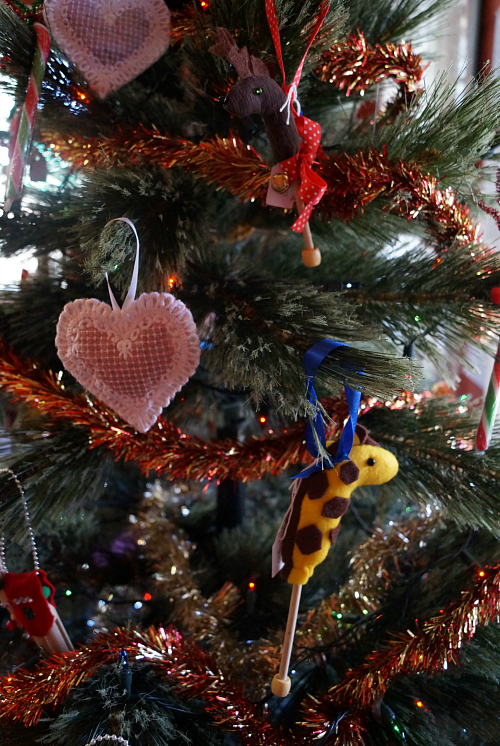 There will be hats, jewellery, art prints and cards, felted items including cards, ornaments and wreaths, sewn items including soft toys, children's clothing, and quilts, local fleece, leather-worked items and more. No matter how detailed a list I give, I keep having to end with "and more". We are just getting so much interest and the people involved are so multi-talented. 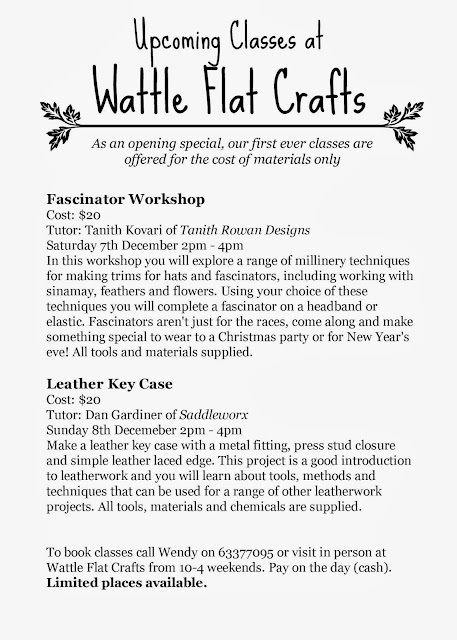 The grand opening and future weeks will also feature craft workshops by our contributors, including myself. 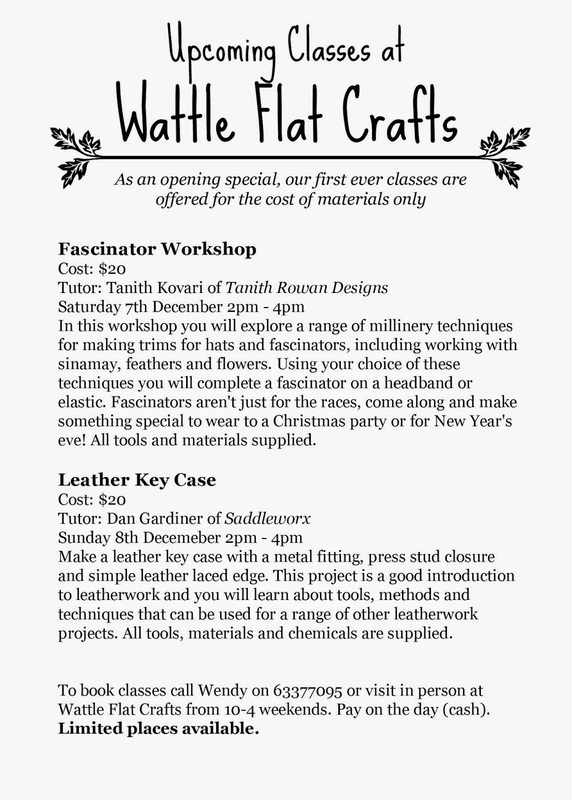 You can keep up to date on the progress and learn more at the Wattle Flat Crafts Facebook page.